This is a #WorkingOutLoud post on some early thoughts for a Journal article. The stratification of society that we see today is not necessarily permanent. The structures of education, commerce, finance and business are simply those which have proved most convenient or fortuitous some parts of society thus far. But what came before may be no indicator of what will follow. Throughout history we have seen different modes of organisation in society, from tribal, to feudal, rural cultures transforming to urban ones, manufacturing to knowledge, with no taxonomy of organisation guaranteed to survive to the next millennia. We live in times of change, significant shifts in the ways we work, organise, communicate, and even identify, with national barriers defined by geography morphing into more global and fluid communities of interest. Where once barriers were geographical and technological, where it was hard to communicate further than the length of a good phone line, or the distance you could ride a horse in the day, communication was always limited. Arguably we are now unlimited. Except, of course, the limits which are placed upon us by governments and regimes. We are in a time of change, but the end of this journey is not clear. The structures that have suited us so well for so long are proving unnecessarily cumbersome in a new world, where technology connects and facilitates us, and community supports us. Even mainstays like the financial service industry are under significant threat and change, and the giants that rule today may be replaced by more forward thinking, often global, and certainly more friendly counterparts of tomorrow. Indeed the nature of organisation may be changing: so often we exist within hierarchical structures owned by the few ruling over the many, with pyramids of wealth and control towering above us. But this is not set in stone: in parallel to these we see small numbers of highly effective and highly efficient cooperative and collaborative models and they may just be the start. Existing against the fractured social contract of the Social Age, where career is a fiction, and loyalty resides more within our communities that organisations, it’s easy to see that revolution may be round the corner. Consider the purpose of an organisation: on the one hand it’s a mechanism of production or service, inventing, building, assembling, selling things. To do so requires certain capabilities, certain facilities, but there is no intrinsic reason why many of them need to be owned or centralised, indeed one major shift we’ve seen has been the outsourcing of core capability and the building of long supply chains. This has usually been based around traditional hierarchies of power, control, and reward, with the money escalating to the top and control being exerted over the bottom. We’ve recently seen the emergence of devolved and democratised systems which allow people to hold their own expertise and economic value. Spaces where people are able to create profiles outlining the services and capabilities they can offer, enabling new methods of connection. In the old world the organising principle was the organisation. If you needed printing done, you went to the print shop. In the New World that no longer holds true. Whilst the organisations may be used to owning the economic capital and utility of the individual, we now see that that utility and revenue potential can be held by the individuals themselves, with revolutionary ways of connecting those who can with those who want. Those who will, with those who need. But this is not a matter simply of transaction: it’s also a matter of reputation and long-term value. Social filtering and reward systems, social rating and recommendation systems, utilise the wisdom of the community, the wisdom of the crowd, to help us not only find that which we want, but to have some measure of validated assessment as to its capability and trustworthiness. Historically organisations have told their own story: shaped by brand and marketing teams and projected by volume alone. In the New World that value was determined by the community. But those same mechanisms which level the power of the organisation and moderate it through the community can do the same for the individual. So not only can individuals compete independently of organisations, but the market itself is rebalanced, leaving us with the question of what, fundamentally, is the organisation for? We could argue that organisations do social good: providing safe spaces for individuals to earn a living, and developmental environments for them to prosper. But how true would that be? How much have organisations ever been for people, as opposed to simply exploiting them in service of the pyramid of wealth. The mechanisms which served organisations so well may very well be the mechanisms that now work to unseat them, or at least reinvent them in a new form. Is this just the start? 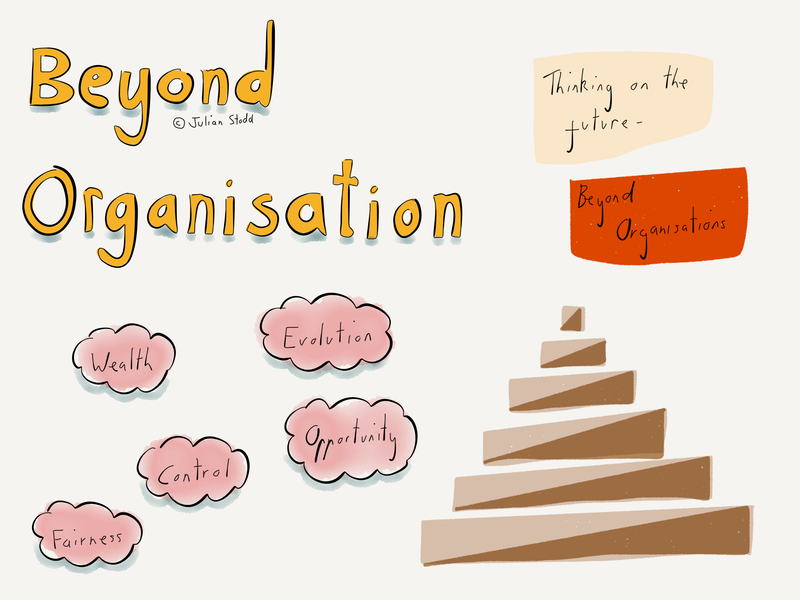 So far we considered how the role of the organisation to own capability may have been eroded. Where does the vision itself reside? Where does the innovation and invention sit? Where does the purpose sit? Especially if we consider purpose beyond that simply of making money. Increasingly we see that vision itself is outsourced into community: communities emerge strongly around shared values and shared purpose, often global communities. We see people coming together to achieve great things outside of any formal organisational structure. It may be that these things are currently the exception and not the rule, but they may prove to be the exception that proves the rule, sign of things to come. Because if we have learned one thing, it is that social systems are highly adaptable: just look at Wikipedia which has gone from a space containing meaningless opinion and an unvalidated knowledge, to a fully capable socially moderated sense making space, often meeting or exceeding the validity of other more established sources. And again, remember, this is just the start. Consider what social mechanisms allow us to do: they let those who have ideas share them, and build community around them. These social spaces are inherently aggregating: they collect people around ideas, around values, around intent. And they do so at great speed. They connect us with capability: whatever you need, you will be able to find it, especially if you have cultivated a sufficiently diverse and strong community, connecting you with validated information about who to get to do what and where. The community connects us with markets too, enabling us to sell, supported by transactional systems beyond the control of the banks themselves. Indeed, with the emergence of bitcoin, we see currency beyond that which is controlled by the nation state. Every aspect of that which used to be the sole preserve of the organisation is now disrupted by new technologies and social systems: what, then, we have to ask, is the organisation for. We could argue that we are already deep into the fragmentation of the supply chain, every car factory is surrounded by a plethora of small businesses making everything from windscreen wipers and alloy rims. But that still operates within the pyramid structure. The shift I’m talking about is a fundamental one of power. It’s a shift away from the organising principle being that of the organisation, towards the organising principle being that of the community. It would be naive to think that new organising principles won’t emerge: doubtless labour will organise under distributed individuals for outsourced systems. Even the systems which hold social reputation, and those systems which make connections, want to draw value. But this is more even distribution, away from a deeply imbalanced pyramid towards simply a hilly landscape. The move towards locally sourced goods and services over the last few years, emergence of farmers markets, and a greater interest in that which is hyper-local and hyper-devolved, has spurred new development in itself. Sure, you can buy a McDonald’s burger anywhere in the world and it will be a McDonald’s burger, but not everybody wants that burger. The rise of the new Artisan craftsman is indicative of more deep-rooted shifts. The key reason is this social repository of reputation. Whilst those hyper-local craftsmen would previously only have had access to local markets, their reputation is now unlimited in scope. The global reach which used to be the preserve of the global organisation is now the reach of anyone with an Internet connection, and an engaged and loyal community, willing to transact a small sliver of the cognitive surplus to help you build your reputation. The shifts we see don’t just relate to retail and commerce, or the provision of goods and services. They relate to fundamental social structure as well. But not only have organisations provided jobs to you, they’ve acted as mechanisms of control over the individual. We used to see this conflict in terms of unions versus the organisation. This level of conflict is familiar. But there’s another dynamic which is the relationship between individuals and state in which the organisation may play a central role. As the organisation loses power the dynamic between individuals and State shift. Some aspects of this already understood, where we see experimentation with different models of democracy, not just direct but also synchronous. Instead of being represented for five years on one manifesto, we see an interest in referendum style votes on every issue, facilitated by mobile technology. Imagine how this will transform democracy itself. Governments are already utilising these principles to get legislation on the agenda, but they were susceptible as the organisation to the unifying power of social channels. This entry was posted in Change, Future and tagged Change, Communication, Democracy, Future of Work, Holocracy, Longreads, Organisational Design, politics, Social Age, Social Contract, Wealth, Work. Bookmark the permalink. Our ancestor used old and incomlete map of their universe – a flat earth- to conquer the seas and discover new lands and new opportunities. We are becoming too comfortable in our apparently complete knowledge of our global markets …thinking like machine about this very complicated world…wrongly confusing complicated and complex. We need to use our old maps to start the journey and have faith that our complex brain will be able to draw new maps … that will become old one day . Ah, Julian – interesting this popped up today as it’s essentially a better version of my first draft for a workshop I’m preparing to present at an education festival in a few weeks! I’m so, so excited about how things will move in education. So much potential. Whatever next looks like we must make sure that we look beyond our community. Digital communities make it very easy to reflect our own reality at us and the see that as truth. If we are to work without hierarchy and across boundaries we need to nurture our curiosity, critical thinking, open-mindedness as well as our listening skills.